Sorry... the 2017 Mercedes-Benz GLS-Class is no longer being sold as new. 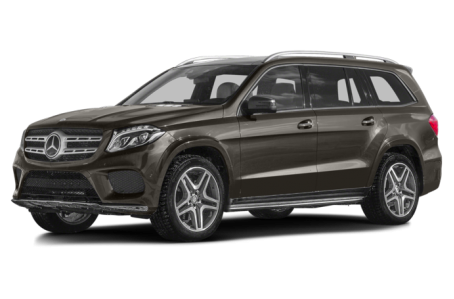 The 2017 Mercedes-Benz GLS-Class is an all-new luxury flagship SUV that seats 7 passengers across 3 rows. It competes with the BMW X6, Porsche Cayenne, and Land Rover Range Rover Sport. It is the successor to the discontinued GL-Class. The high-performance AMG version will be covered in a separate overview. Two trims are available: the GLS450 and GLS550. The GLS-Class is the largest of Mercedes SUVs. While the GLS450 looks more similar to its GL-Class predecessor, the GLS550 shares the same “Sensual Purity” design language as the rest of the Mercedes lineup. The front-end has inner-concaved headlights, a large tri-star emblem at the center of a massive grille, and an aggressive fascia. At the rear, the taillights and chrome trim have also been revised. Standard features include LED headlights, LED daytime running lamps, power side mirrors, a power liftgate, and a power moonroof. Available features include a panoramic moonroof, a trailer hitch receiver, adaptive suspension, and unique 20-inch wheels. Powering the GLS-Class is a standard 363-hp, twin-turbocharged 3.0-liter V-6 engine mated to a 9-speed automatic transmission and rear- (RWD) or all-wheel drive (AWD). A 449-hp, twin-turbocharged 4.7-liter V-8 is also available with 1,800 lbs.-ft. of torque. Maximum towing capacity for GLS-Class is 7,500 lbs. Inside, the GLS-Class features a luxurious leather interior with a 60/40 split-folding second-row bench seat and a 50/50 third-row seat. The interior cabin has numerous available amenities, including an air purification system, an air fragrance system, rear seat entertainment, and tri-zone climate control. The center stack features a standard COMAND multimedia system, which includes an 8-inch touchscreen, Bluetooth connectivity for phone and audio, and dual USB ports. It can be upgraded with an integrated navigation system and a Bang and Olufsen premium audio system. Other optional features include a wood/leather steering wheel, a power/heated steering wheel, power/heated front seats, ventilated front seats, and heated second-row seats. Standard safety features include a backup camera and a tire pressure monitoring system. Available features include adaptive cruise control, forward collision warning, pedestrian detection, active brake assist, a blindspot monitoring system, lane keep assist, park assist, and surround view.